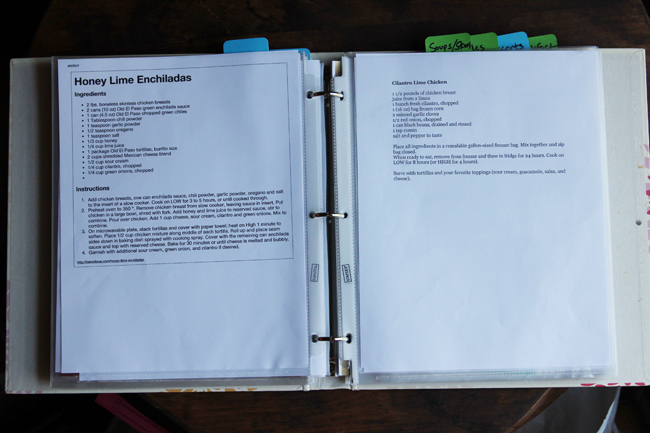 One item that has been on my 30x30 list forever has been to organize my recipes. I had a giant stack of magazines that I'd saved just for one or two recipes, cookbooks with bookmarks on my top favorites, Pinterest boards overflowing with food pins, and printed recipes stuffed inside cookbooks, never to be seen again. Something needed to happen, but I kept putting it off because I knew it would take a good chunk of time to sit down and organize everything. 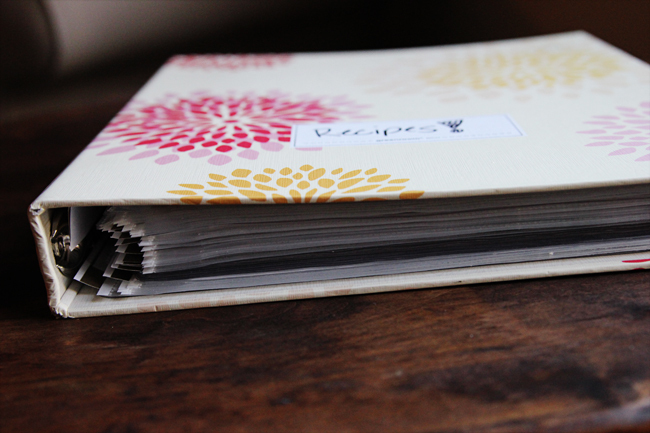 Making your own recipe binder will take time, but hopefully if you do it right, it will save you a ton of time in the future because all your favorites will be printed and organized in one place! I'm sure there are lots of different ways to make a recipe binder, but this is how I've done mine. I take zero credit for this idea, by the way! My friend Hannah has hers organized like this, and as soon as I saw it, I knew I needed to make one for myself. 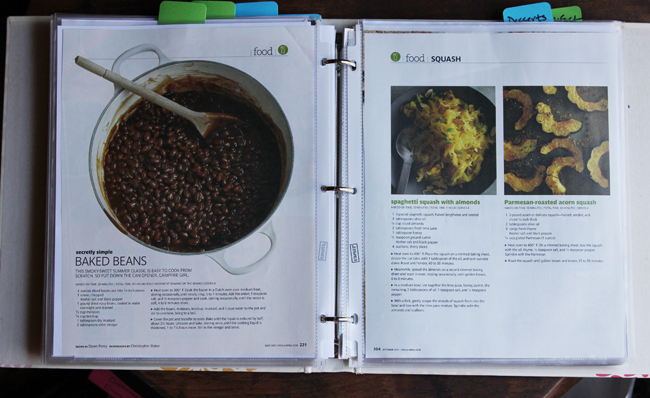 NOTE: The recipe binder is not intended to be a replacement for your cookbooks. It is specifically for organizing recipes you find online/someone tells you/you found in a magazine. 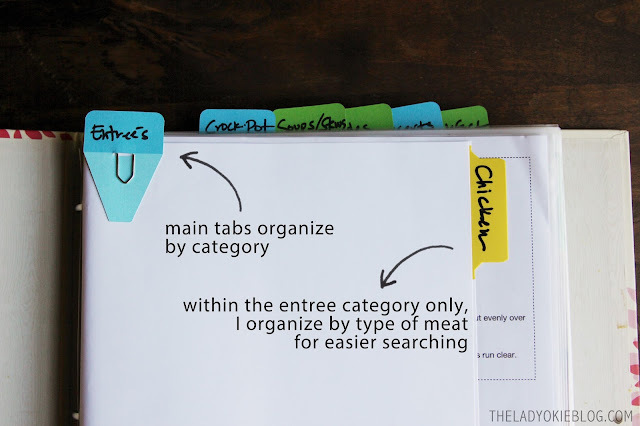 This is to organize all those random recipes scribbled down on scraps of paper or folded between pages of a notebook. Additionally, if you do have a cookbook you use for just one recipe, why not make a copy of the recipe and give away the cookbook? No need to keep an entire cookbook for just one or two things. Obviously your organization method will vary depending on what types of foods you eat. If you're a vegetarian, you clearly will not have categories organized by type of meat like I do, but you get the idea. My main tabs at the top are: Entrees, Crock-Pot, Soups/Stews, Sides, Desserts, Breakfast. See? So easy! 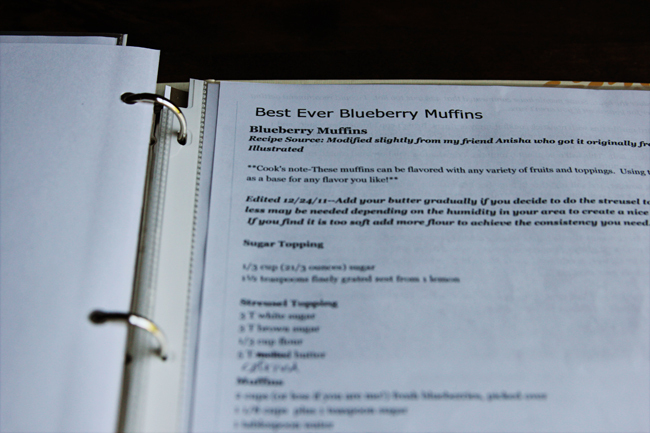 After all your printing and typing and copying, you should have all your recipes together in one place, organized for easy reference. Now recycle those magazines you've been holding on to, and get to cooking! 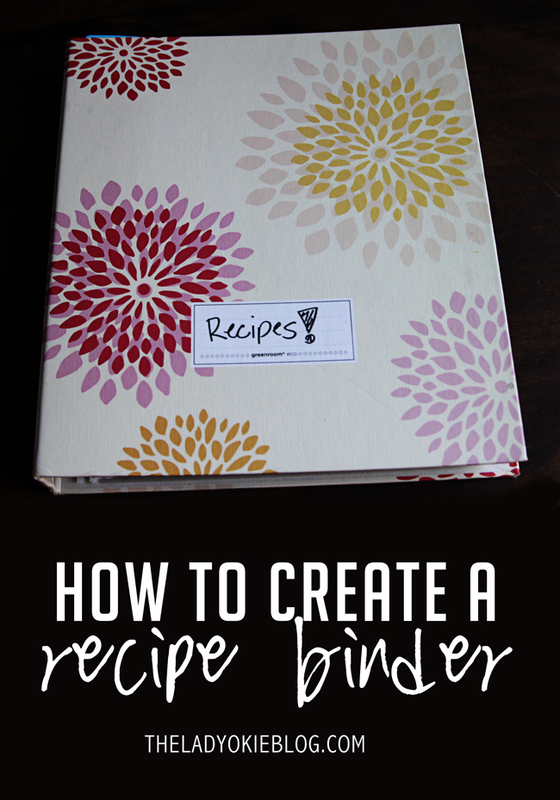 This recipe binder makes me so happy! It's so easy to find recipes now, and I love how they are organized by type so I can flip right to the category of food I'm looking to make. I was glad to be able to cross this off my to-do list. Shoutout to my friend Hannah for the brilliant idea! Questions? Leave them in the comments and I'll get back to you! That is great! I have a Moleskin notebook that is for recipes I want to write out but I love this idea for ones found online and in magazines! I have a recipe binder at home, but it hasn't been updated in a while, and it's not organized either. I definitely need some dividers to help me out! I love this! I rely too much on electronic versions of recipes and it would be so nice to have something like this more accessible! I have a small box with dividers in there for a lot of my recipes. In Myanmar I just write them down in a journal. Oh how I love binders and tabs and all things school supplies! I keep all of my recipes on Google Drive. I have folder that's shared between my mom and my brothers so we can access our recipes at anytime. It's also helpful if I'm at the grocery store and think "Oh, I should really make orange chicken this week. What ingredients do I need?". Then I can just pull up Drive on my phone. 90% of the recipes on there are my brothers and he recipe tests a lot, so when we makes changes, they are ready to go. For my bridal shower, all of my friends and family shared their favorite recipes with me on recipe cards that I have in a small binder. I'd like to type those up and make photocopies in case something ever happens to them (hand written recipes have so much character). Ahh, I love organization projects such as this. 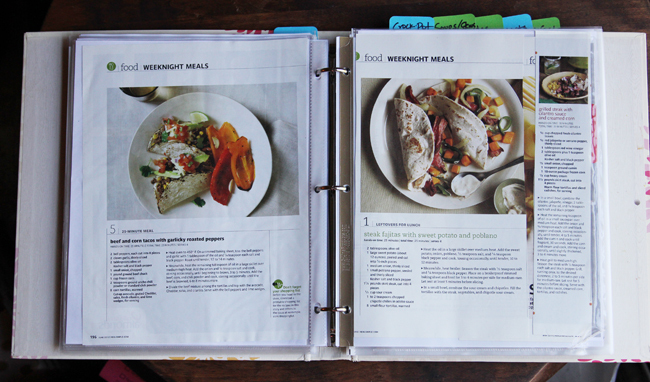 I bet that you get an awesome feeling of satisfaction anytime you pull out your favorite recipe binder to make a delicious meal/snack/treat! Win-win. I was in desperate need for this post!!! 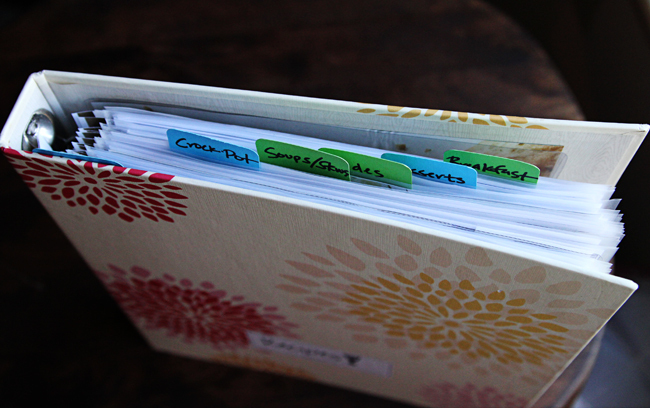 I have a few recipe binders and a bit stack of recipes to file. Cookies have their own binder. Is that a bad thing? Your idea to use page protectors is genius!!! This way all of your pages are the same size and your whole binder is really neat. I haven't done that, but maybe I should! this is such a good idea - why have i never thought of the page protectors and tabs? seriously, brilliant. i have piles of recipes i've printed, then i forget about them and can't find anything. i need to do this. i pinned it, so maybe i will. in like a year. This is a brilliant idea! I wish I was more organized...I'm really trying to improve, but it's difficult! I'm going to make one of these one day! Pinning for later! I need to do this! More often than not when I use recipes I found online I don't print them out and save them, and then a few months later I'm scouring through websites trying to find that exact recipe I used This is a great idea though! Yes! It's a lifesaver having them all in one place. Not bad! My binder is getting pretty stuffed too with (online) recipes, so I could use a little organizing! I do the same thing though my binder isn't as cute and I didn't make tabs. Great way to find them easy and free up space! What a neat idea! This is definitely a DIY project, I am pinning this. What a great idea! I tend to keep all my recipes on pinterest so if the internet ever goes down I'll have to have completely new meals planned out! I have something like this, but it's not as organized as yours, ha! It's more like a meal planning binder, that I use to outline our monthly menu and I have recipe inside that I go through and pick out for the month. But this has inspired me to create a more organized binder, woot! I so need to do this. Right now, I have about five thousand cookbooks and food magazines that I pull recipes from, and probably a couple hundred recipes jotted down in three notebooks I've had forever. When I really get a good one, it goes on the blog, and I'm working on a couple recipe e-books, but in the meantime, I need some order in my kitchen! But Really, Have You Been Running?